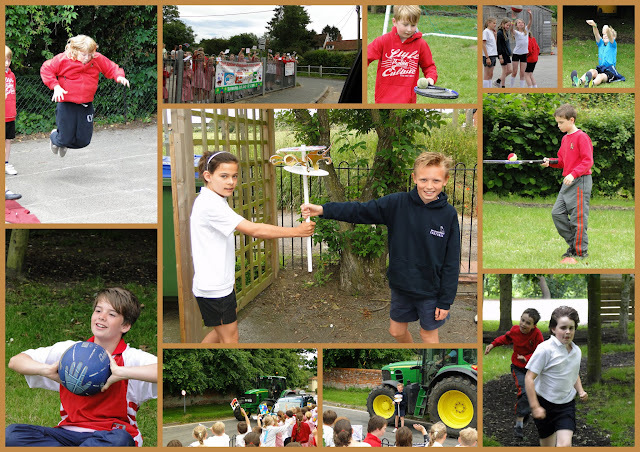 This afternoon, year five and six pupils set off on the second leg of the Pyramid Olympic torch relay, taking the torch made by pupils at Easton on to Charsfield. The torch made a grand entrance on board a gleaming green tractor, whereupon it was delivered to a representative from Charsfield school. Having passed on the torch we were then invited to an afternoon of sporting activities. The children participated in a rotation of different track, field and court events prepared by our hosts. The torch will continue its journey on to Dennington tomorrow, in the lead up to the real Olympic torch procession through Wickham Market which we will be attending on Thursday.